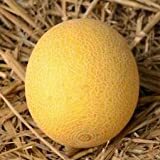 Melon ''Galia'' ~15 Top Quality Seeds - Amazing Sweet Taste and Flavor! 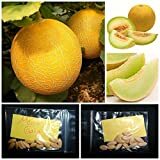 Melon plants for sale – Easy plant to grow with edible fruits and seeds, planting season in spring and in hotter climate end of the winter and better to buy seeds or plant. Fruit harvesting season in the summer to autumn in round to oval shaped flowers that appear in orange, green or yellow color.